Let’s talk about us! We have dreams and we have visions, best of all we want to share them with you! 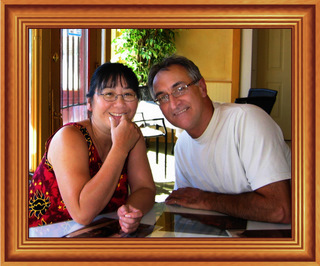 Frank and I got married in the summer of 2008 in the beautiful forest of the Hummingbird retreat. 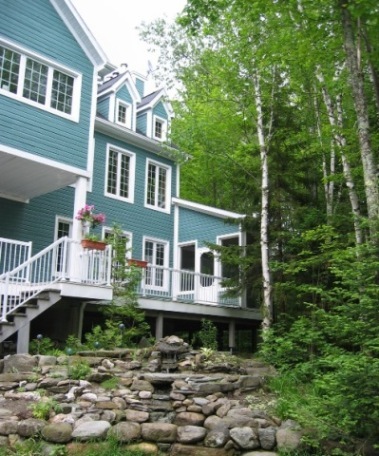 It was in 2001, when Frank first shared his dream with me of building a retreat in the beautiful Eastern Townships of Quebec. His heart fondly remembers his wonderful childhood spend every summer by the lake. He recalled how the lake would mirror the trees to create beautiful reflections on the water. The quiet canoe rides, the breathtaking sunsets but most of all he found peace deep in the forest and he found peace in his heart. I felt his heart and saw a simpler vision, a place to retreat, to find peace, a space for meditation, for holistic healing work and for massage. I saw a place where people can come and find personal balance with loving support. I saw all those visions about us there and the lovely quietness of the surrounding took my breath away. Then in 2004, We decided to make our dream come true, we kept the existing foundation where the old chalet was and we added to the foundation to make it larger. 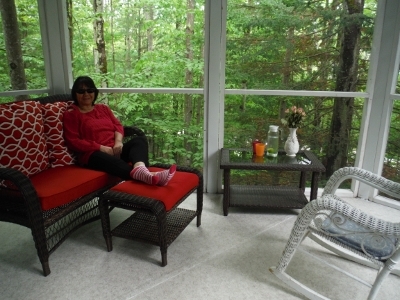 By this time, our vision was getting bigger; we wanted the country house to be spacious and comfortable. 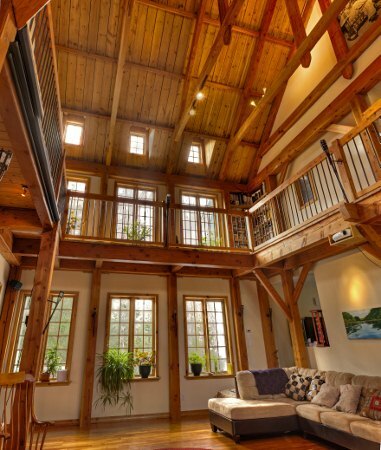 The living room made in timber frame with a vaulted ceiling of 32 feet high and a walk around mezzanine. Two spacious verandas on the side of the house, balcony in the front and in the back, five spacious rooms and wooden floors throughout the house. It’s a beautiful dream and its all about us. The dream did not stop there; We wanted to utilize the wood we harvests in the forest to supply all our heating needs for the house. In the basement, we have a wood furnace install and hooked up a large water tank which distribute water into tubes for radiant floor heating. We also used our wood from our trees to make some of our floors, the living room floors are made from our own cherry wood. We thought it was the ideal way to go. 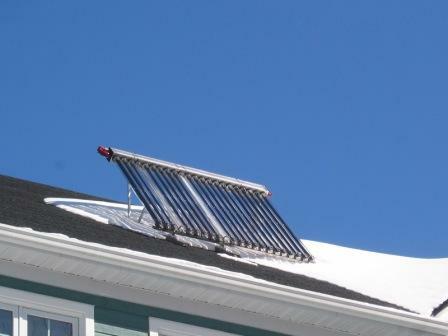 Last year, we added on solar panels to help increase the efficiency of heating system to supplement our hot water requirement and this is only the beginning! This year we added even more hiking trails in the forest, the possibility are endless! We have our own water supply and we have access to our own spring water which is absolutely beautiful. 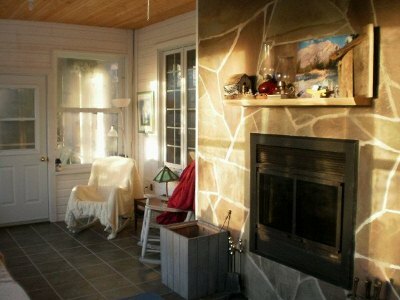 A place of quiet serenity, a place of healing, to renew body, mind and soul! A place to retreat and to regain personal balance and best of all, we wanted to share all of this with you! We have a wonderful forest with a lot of biodiversity and walking trails that are marked. We are planning to offer meditation places in energy vortex areas that we have found in our forest. Very powerful places to be. We hope you will come and experience this healing place for yourself; come sit on the dock by the lake, take a canoe ride and take in a beautiful sunset. You can find rest on our cozy veranda, or have a peaceful sleep in one of our spacious room, meditated in the forest, explore our hiking trails, take in some healing sessions or an energy massage. Whatever you need to regain a sense of “well being,” you can be sure, we are here for you! !